“The People’s Tree” hails from the Kootenai National Forest, adorned with star, skirt and ornaments all made in Montana. Victoria Scordato photo Three-thousand handmade decorations from Montanans adorn the Capitol Christmas Tree. 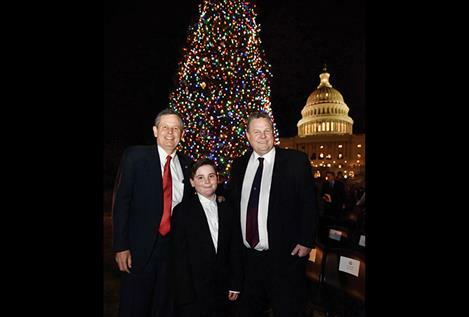 Senator Steve Daines, Bozeman sixth grader Ridley Brandmayr and Senator Jon Tester pose in front of the lit U.S. Capitol buliding’s Christmas tree from Montana. WEST LAWN, U.S. CAPITOL – U.S. Senator Jon Tester kicked off the holiday season on Thursday, Dec. 7, alongside Bozeman sixth-grader Ridley Brandmayr as they lit the Capitol Christmas Tree on the West Lawn of the U.S. Capitol Building. As the senior Senator from the tree’s home state, Tester was tasked with selecting the tree lighter and helping organize this year’s celebration. He asked Ridley Brandmayr after the Bozeman sixth grader lost his right hand in a tragic accident earlier this year. Tester lost three fingers on his left hand in a similar accident when he was a kid. The 79-foot Engelmann Spruce traveled nearly 3,500 miles from Montana’s Kootenai National Forest to grace the lawn of the U.S. Capitol building — making stops in 13 Montana cities along the way. 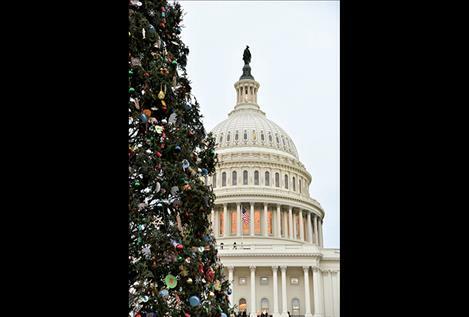 Since 1970, a different national forest has been chosen each year to provide the U.S. Capitol Christmas Tree. The last tree to hail from Montana was a Subalpine Fir from the Bitterroot National Forest in 2008. The Kootenai National Forest also provided “The People’s Tree” in 1989. In addition to the 79-foot U.S. Capitol Christmas Tree, Montana sent 77 smaller Christmas trees to Washington D.C. to decorate the halls of Congress, the U.S. Forest Service, and other federal office buildings across the nation’s capital. These trees came directly from the Kootenai National Forest with handmade skirts and ornaments straight from Big Sky Country. Senator Tester’s office received our personal tree on Friday morning. Others in attendance included Larry Spiekermeier of Whitewood Transportation, the man who drove the tree across nearly a dozen states over the course of a two-week journey. Spiekermeier is a two-time Montana Motor Carriers “driver of the year” who hails from Plains, Montana. He will celebrate a half century on the road next year.